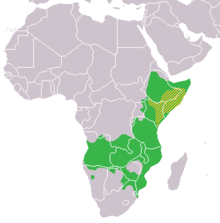 eastern Africa, particularly Ethiopia, Kenya, and Somalia. East to southern Central Africa, from Eritrea and Ethiopia to the provinces of Limpopo and Mpumalanga in the Republic of South Africa. 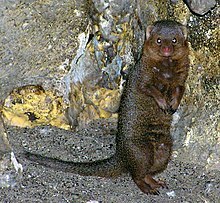 The helogales are the smallest species of mongooses and both are endemic to Africa. The distribution of the Ethiopian dwarf mongoose is more tropical, and overlaps completely with that of the common dwarf mongoose, which is more widespread. Both are social diurnal species, and due to their small sizes they are vulnerable to predation. Both species live independently of open water. ^ Wilson, D.E. ; Reeder, D.M., eds. (2005). "Helogale". Mammal Species of the World: A Taxonomic and Geographic Reference (3rd ed.). Johns Hopkins University Press. ISBN 978-0-8018-8221-0. OCLC 62265494.